When I was growing up, in the Stone Age, there was a special treat at the local bakery called a Charlotte Russe. In its Bronx incarnation, it was a simple piece of sponge cake beneath a huge mound of whipped cream (real whipped cream: thick, rich, and elegantly sweet), topped with a Maraschino cherry. The lower half was wrapped in a white container of thin cardboard (like a coffee cup sleeve, but smooth and thin) with another round piece of thin cardboard at the bottom to push up and expose the sponge cake as the whipped cream disappeared. You could eat it like an ice cream cone, or (only if you were on the way to visit relatives and had to keep your shirt clean) with a spoon. It was as popular in its day as the equally legendary Egg Cream (available from the hole-in-the-wall soda shop with the round red-cushioned counter seats conveniently located down the street), which often functioned as a chaser for the Charlotte Russe. They helped make me the man I am today. Originally invented by a Russophile French chef, the Charlotte Russe reportedly has disappeared from Bronx (and Brooklyn) bakeries. 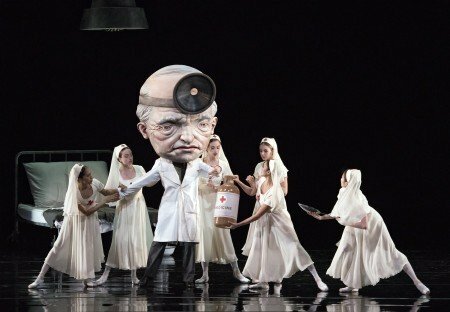 But it’s now back – in the form of a new ballet by Russian-born choreographer Alexei Ratmansky appropriately titled Whipped Cream, which itself originated in Vienna as a ballet titled Schlagobers, created by a German composer and choreographer: respectively Richard Strauss and Heinrich Kroller. 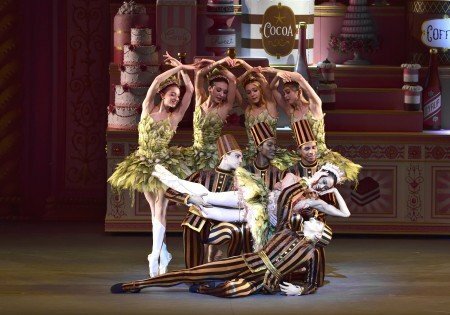 Whipped Cream is intoxicatingly gorgeous, and tons of fun – but it comes perilously close to being the ballet equivalent of a pop-up coffee table book for very young children. Schlagobers (“whipped cream” in German), which premiered in 1924, was best known for its 287, give or take, extravagant costumes and sets. Ratmansky’s recreation, which premiered two months ago during American Ballet Theatre’s engagement in Costa Mesa, CA, also has extravagant costumes and sets. [My understanding is that the costumes and sets, as well as the choreography, though perhaps inspired by those for Schlagobers, are original for Whipped Cream.] I can’t speak to the quality of the original ballet’s costumes, but those for Whipped Cream, designed by American artist Mark Ryden, are flat out brilliant. Unfortunately, unless one takes great pains to see beyond them, they can easily overshadow everything else in the ballet, including Ratmansky’s equally brilliant choreography. Before I proceed further, I must recognize something (someone) else that’s back. Monday’s Whipped Cream performance, its New York premiere (and the occasion of ABT’s annual Spring Gala), marked David Hallberg’s long awaited return to the Met stage with ABT after years of injury recuperation. While this role may not be the most demanding in his repertory, it requires quicksilver movement and no small amount of technique, and he executed well. His return will undoubtedly energize the company and its audiences. To a large extent Whipped Cream resembles The Nutcracker ballet (which was not produced in the west until 1929). Instead of a girl who falls asleep and dreams, there’s a boy who gets sick to his stomach from ingesting too much whipped cream (the ballet’s touch of verisimilitude), sleeps, and dreams; instead of a Land of the Sweets, there’s a kingdom of the Praline Princess; instead of Coffee, there’s Tea (and Coffee…and Cocoa…and Sugar…and Marzipan…and Sugarplums…); instead of an oversized tree there are oversized heads; instead of Drosselmeyer, there’s a somewhat unhinged Doctor; and instead of snowflakes, there are dancing peaks of whipped cream. Moreover, much of Whipped Cream, particularly in Act II, is a parade of outlandish (but lovable) non-dancing characters who evoke oohs and aahs, and who you may want to reach out and hug, or take home if you could to place on your mantle, decorate your lawn, or populate your child’s toy box. At one point, the stage looked like a condensed circus parade/sideshow of benign and delightful imaginary humanoid beings. Collectively, they provide the ballet’s backbone. Beyond the overwhelming costumes and carnival of visual delights, both of which must be ignored in order to appreciate the ballet on more than a surface level, there are two main problems with Whipped Cream. First, although the score was created for the ballet (individual waltzes excised from the score were separately produced later), Strauss isn’t Tchaikovsky. There’s nothing that really stands out, and too much that sounds at the same emotional level. 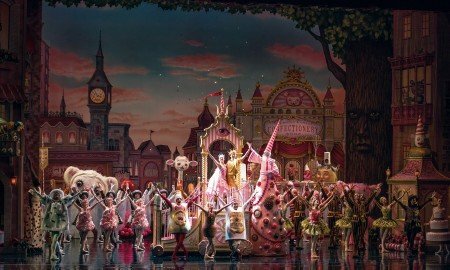 A more critical problem is its story – which is thinner even than that for The Nutcracker, and which will produce a headache as well as an upset stomach if one gives it more than passing thought. Such as it is, the story is of a nameless boy who, after receiving his first communion, goes to a local confectionary shop (a Konditorei in the original) to celebrate with his friends, where he overindulges on whipped cream, gets sick, and is taken to a hospital. While in transit and dreaming (and out of audience view), the bake shop canister contents come alive (think Toy Story), after which the boy’s dream takes him to a world of whipped cream. In Act II, the boy awakens to a somewhat macabre hospital room, where, under watchful eyes, he’s treated by a doctor and an army of nurses bearing syringes. While under the influence of the medication the doctor orders, the boy conjures Princess Praline and her entourage, and dreams of escaping with her. Later, with the help of some spirited spirits, Princess Praline “in real fantasy life” actually does enable him to escape to her kingdom and live happily ever after in high caloric bliss. It’s no wonder that the ballet often looks like a series of divertissements in search of a story. So, forget the story, ignore the score, and if you can, look beyond the pervasive and inescapable, seriously whimsical, and absolutely enthralling costumes and non-dancing (or limited dancing) characters. There’s more to Whipped Cream than that. Like most everything Ratmansky, the choreography, primarily for the lead characters and supporting corps dancers, is much more complex than it looks. There isn’t a moment of choreography that doesn’t illuminate the character/situation for which it’s being used, or that’s not true to the music. It’s quite miraculous. And it’s displayed from the outset – with nifty corps work for the platoons of Marzipan, Sugarplum, and Gingerbread Men, and very interesting choreography for Stella Abrera’s Princess Tea Flower and her Attendants – and it’s even more evident later in Act II, with the lightning fast fancy footwork for Sarah Lane’s Princess Praline (part of her solo component of a lively pas de deux for her and Daniil Simkin’s The Boy), and an intriguing pas de quatre. But the showstopper is the final scene in Act I, featuring sixteen individual wisps of whipped cream. 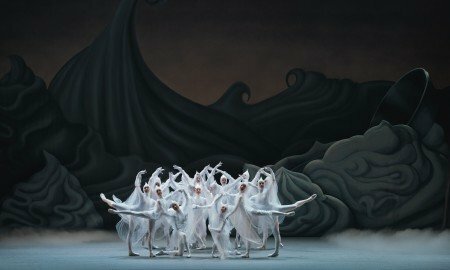 With each wisp costumed in pure white (white leotards, pointy white “whipped cream” caps, and covered loosely with white feather-light fabric that look like oversized creamy, free-flowing angel wings), their dance looks like a heavenly cross between the Shades in the Act II entrance to La Bayadere (with the “wisps” sliding down a whipped cream mountain) and, of course, the Snowflake conclusion to Act I of Ratmansky’s Nutcracker. Just as that scene was a visual knockout of complexity in the guise of simplicity, so this one is – except instead of snowflakes buffeted by wind and finally settling to the ground, the “Wisps Dance” is a swirl of slowly dissolving cream. Characterization isn’t the ballet’s strong suit, but what characters there are are appealing, albeit primarily one dimensional. Princess Tea Flower is decidedly not an Earl Grey blend (or brisk Lipton) – Ratmansky’s soft-edged, stress-free choreography personifies her character as exotic Oolong; slow, relaxing, and sensual (but not at all reminiscent of Balanchine’s Coffee). She finds her opposite attraction in the ardent, and highly caffeinated, Prince Coffee (Hallberg). Princess Praline is a sweet as sugar little boy’s dream, a girl who’ll provide him with unconditional adoration and limitless candy (a reverse permutation of Clara’s dream of herself as Adult Clara in Ratmansky’s Nutcracker). And The Boy – well, he’s a nice boy who smiles a lot and can dance. There are missteps here. Serious ones. In the first instance, there are the characters of Mademoiselle Marianne Chartreuse, Ladislav Slivovitz, and Boris Wutki. There’s nothing wrong with them as characters (and they’re in the original Viennese production, as political symbols), and Chartreuse, danced by Catherine Hurlin, provides the ballet with a much needed shot of two-dimensionality, moving from being a slightly tipsy seductress to a slightly tipsy comedian and back. She’s very good. The alcohol is used thematically (and humorously) as a way to distract the Doctor with the huge head (played with surprising personality by Alexei Agoudine) so Princess Praline can “really” rescue The Boy. However, with young children as an anticipated audience component, demonstrating alcohol’s effect in this way, although undeniably funny, could be seen by some as problematic. Much worse is the bevy of Nurses carrying oversized hypodermic needles, who, on the Doctor’s orders, inject The Boy with some unspecified medication that causes him to pass out – and dream even more extravagantly than he did as a consequence of the whipped cream. [The nurses also carried a medicine bottle; it’s possible that my viewpoint was obscured, and the medicine was spooned directly, rather than injected into The Boy with the hypodermics, but to me that’s a distinction without much of a difference.] Utilizing hypodermic needles, no matter how humorously intended, isn’t funny, and could easily have been avoided. To many the sedative/hallucinogenic effect of drugs may be benign, but in this day and age, why go there? Be that as it may, it’s obvious that Whipped Cream will be a joy for young children to visually ingest, and adults can appreciate the art and the choreography. I can see the marketing possibilities now: The Boy, Princess Praline, Princess Tea Flower, and Prince Coffee action figures; Snow Yak and Worm Candy Man plush toys; Chef/Doctor/Priest bobble-heads; whipped cream wisp mints; and maybe limited edition infused chocolate bottles of non-alcoholic chartreuse liquor, vodka, and whiskey. Ok, maybe alcoholic too. The mind boggles. Whipped Cream isn’t great ballet, but it’s pretty good for what it is. Is it worth seeing? Yes – at least once. Would I rather have Ratmansky’s The Nutcracker back in New York – definitely yes. [Maybe for the holidays the company can go bicoastal, with annually alternating productions on each coast.] And would I rather have had ABT spend the money it had to have spent for this production (the program lists 15 separate contractors for constructing the costumes, sets, fantasy characters, giant heads, hats, wigs, and footwear, not including Swarovski, which provided the crystals used on tiaras among other things and was the Spring Gala’s lead partner) on something more substantial, as many will likely suggest? Probably. But at this point, that’s immaterial. Maybe it’ll eventually settle in as a must see holiday destination for children with parents in tow, and become a cash cow. And if I want substance before my Charlotte Russe ballet, I can always stop off at the Carnegie Deli for a corned beef sandwich before the performance. Wait. What? The Carnegie’s gone too? Alexei, can you do a Corned Beef ballet, on wry?